The difference between symphonic black and atmospheric black maybe small to some but large to others. For the most part, atmospheric black metal has been the preferred style for musicians as it can work with varying levels of production. Symphonic or neoclassical black metal has had less of recent history only becasue it weighs down a band into a certain sound. I only make mention of this history as it seems symphonic/ neoclassical black is the more antiqued style. This is important because when returning to the sound, a well crafted record could bring back all of these warm and strange emotions. Griseus is filled with things. Lots of things. Tons of things. At a running time of 79 minutes, this Australian band has put nearly everything inside of their debut record. 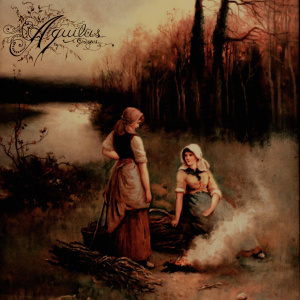 While some bands use symphonic elements as accents, Aquilus has dedicated themselves to vast landscapes of classical atmosphere. Songs like “Loss” have metal elements appearing at around 7 minutes with a preceding crescendos of strings and piano. In fact, arguments could be made that metal elements are only the thread which weaves this delicate quilt together. As I make jokes, it is important to point out that as far as this band goes in terms of flair, it is difficult not to get caught up in the majesty of Griseus. At the end of the day, an effective album pulls its listeners in and allows them to experience a world of sound. Sometimes this world is dark, bleak and barren while other times it is filled with lush landscapes. Aquilus maybe something that is different than most things on this site but in the end a well constructed album is similar to others like it. The band is also without some of the lauding and overpraise that similar bands in the same style have wrapped around their necks like albatrosses. The approachable nature of the band combined with the other worldy album is something that is working well for now. The holidays are approaching and it maybe the right time to climb inside a golden fantasy and not come out for a few months.